11.18.2005 - I'm commonly called to Florida homes to remove snakes from swimming pools. Many snakes are aquatic, and are drawn to water. It's entirely possible that they can sense water from a distance, as do many reptiles, perhaps by scent, or perhaps by seeing UV refraction reflecting off the water's surface. Regardless, a body of water will attract certain critters, and snakes seem to commonly end up in people's pools. Of course, a swimming pool is not a suitable habitat in which to live. The chlorine makes the water uninhabitable for most life, so there's no forage. I don't know if the chlorine damages the snake's skin, but probably no more than it does a person's skin. 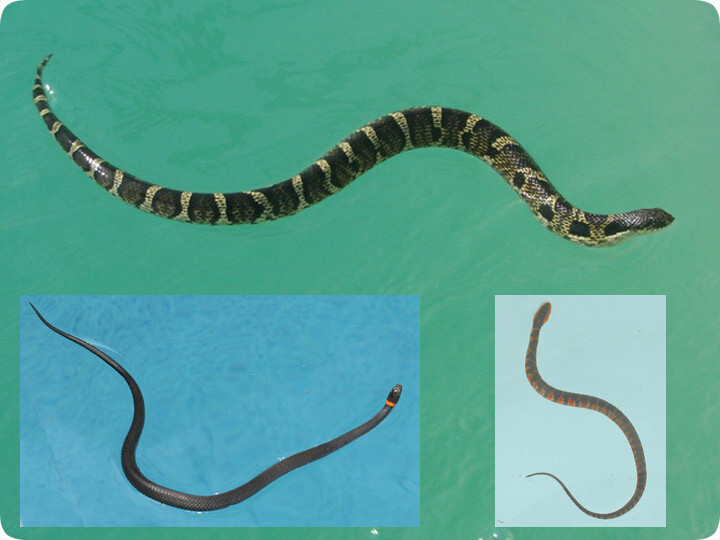 One of the problems a snake has when entering a pool is that a pool, unlike a lake or pond or stream, does not have a gently sloping back from which to exit. Pools have sheer walls, and thus when a snake enters a pool, it often cannot swim out. Thus, I'm called out to the scene. While certain aquatic snakes do dive, it's usually a simple matter for me to grab the snake with some snake tongs, or even the pool skimmer. From time to time, I've removed exhausted snakes from the pool filters. In the above photo, the largest snake, on top, is an Eastern Hognose Snake. It's not normally a water snake, but it got stuck in the pool. Then in the lower left, we see a Ringneck Snake. The Ringneck is very common in Florida, and it's not a water snake either. It probably just slithered into the lanai and then into the pool, and it got stuck. The snake in the lower right is an Eastern Mud Snake, and this snake is often an aquatic snake. Regardless, most snakes are fairly buoyant, and can swim just fine. If you see a snake in your pool and want it removed, just give me or a different local wildlife removal specialist a call!